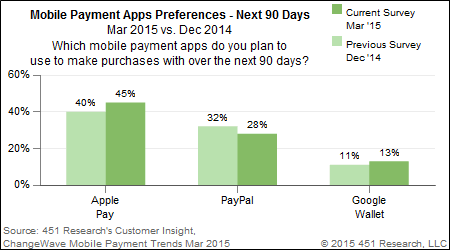 The latest survey from 451 Research seems to corroborate Tim Cook’s forecast: 2015 will be the year of Apple Pay. There were reports about Apple Pay gaining traction — Canadians can only hope to use it in November — but the most recent survey shows an unprecedented growth at the expense of PayPal. 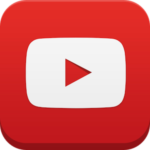 Oh, and the popularity of Apple Pay seems to be positively affecting Google Wallet as well, although iPhone users are twice as likely to use mobile payment apps as Android users are (via MacDailyNews). A quarter of the US smartphone users surveyed by 451 Research say that they will likely use mobile payment apps within the next 90 days. iPhone users make up the most of them at 34% — 45% of them plan to use Apple Pay, but only 16% of Android users plan to use a mobile payment app. This drops to 13% for BlackBerry users and 5% for Windows Phone users. 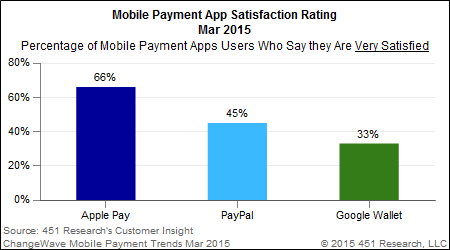 In terms of satisfaction, Apple Pay leads once again: 66% of the surveyed users are very satisfied with the service. By comparison, only 45% of PayPal users and 33% of Google Wallet users said the same. The first wave of Apple Watches is about to reach owners, so it was interesting to know whether customers interested in the device would use their wearable to make a purchase. As it turns out, 54% of them plan to, so merchants better be ready to take their (mobile) money!